This post was originally published on July 13, 2011. It was substantially revised and re-posted on June 22, 2015. Today’s feature is either a new spin on current favorites, or a medieval rarity ready for a comeback. 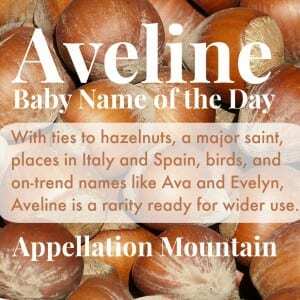 Thanks to Kayleigh for suggesting Aveline as our Baby Name of the Day. If Aveline didn’t exist, someone would have invented the name by now. We just plain love the sound! 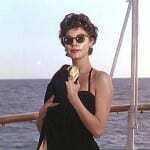 Ava ranked #5 in 2014, with Avery at #13. Ends-in-line options include the Top 100 Madeline and Caroline, as well as up-and-comers like Adeline and Evangeline. Don’t forget Ev- choices like Evelyn, Eva, and Everly. Smoosh name Avalynn debuted in the US Top 1000 in 2014 at #947. 58 girls were named Aveline in 2014 – a new high, but still a far cry from the 262 required to break into the charts. Let’s step into our time machine and visit medieval England. Avice was a given name. It could come from the Germanic Aveza, or possibly the Latin word avis – bird. In our age of Lark and Wren, it is likely that some parents will find those fine-feathered associations pleasing. Daniel Baldwin has a little Avis Ann. Aveline could be a diminutive form of any of the Av- names. Then there’s Saint Teresa of Ávila, a sixteenth-century mystic. Ávila is a day trip from Madrid. Back in Teresa’s day – the sixteenth century – it was an imposing fortress, a walled medieval city. Ávila was established by the Vettones, a Celtic tribe, probably by the fifth century BC. They called the place Obila – high mountain. The pronunciation isn’t intuitive for an American English speaker. It’s AH vee lah. Odds are that you’d hear ah VEE lah in the US. It’s easy to imagine Aveline being chosen as an honor name for the saint, too. There’s one more possible origin for Aveline: the French word for hazelnut. This puts her in the company of other edible appellations, like Pomeline and Clementine. But the word typically used in French for hazelnut is noisette. A nineteenth century French-English dictionary lists avellana as the English word, and aveline and noisette as the French. It’s a bit tangled, but it makes sense: corylus avellana is the scientific name of the common hazel, derived from avellana nux sylvestris – wild nut of Avella – a term used to describe hazelnuts dating to a sixteenth century botanical guide, and referenced by writers as far back as Virgil. Avella, if you’re wondering, is located in Italy, near Naples. That’s the city’s seal in the illustration above. The Roman name was Abella, of uncertain origin. Over the years, the region and it’s most important crop came to share the same name. The Spanish word for hazelnut? Avellana. The challenge: it’s easy to imagine an Aveline today being mistaken for Adeline and Evelyn and so on. And yet, this name is undeniably attractive. It’s culture-spanning and meaning-rich. 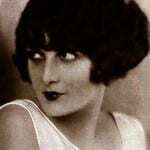 I love the story of this family who named their daughter Avalene, after a great-aunt Avallina. There’s a lovely Aveline on this blog, written by a globe-trotting mama. 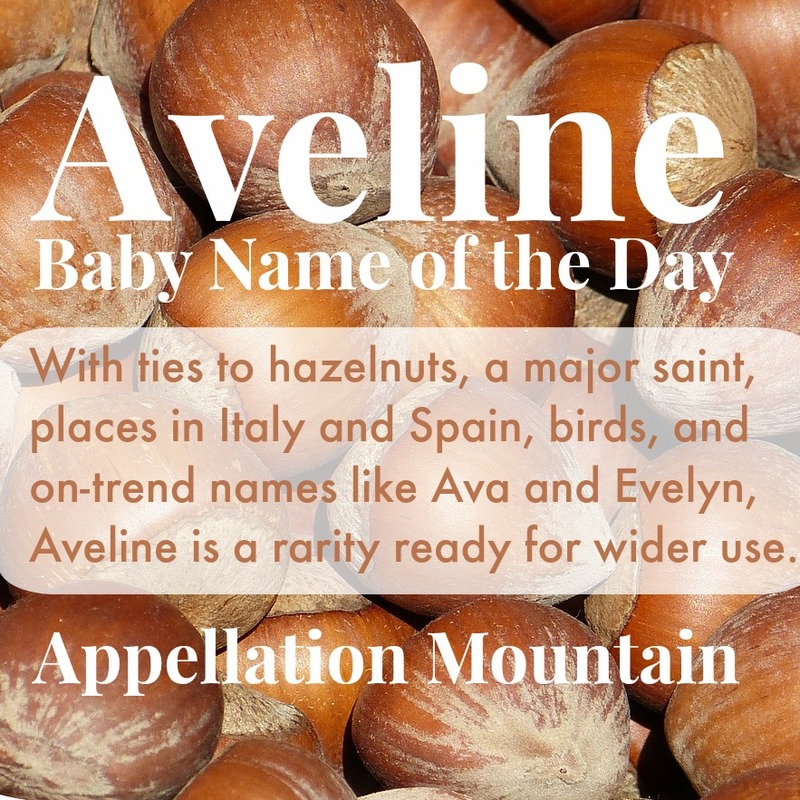 If you don’t mind repeating your child’s name, Aveline might be the perfect just-a-little-different option. What do you think of Aveline? Is it a fresh spin on current trends, or likely to be confused with Ava and Evelyn? My baby girl is Everly Aveline. So obs I love it!!! I love this name, and I love its convoluted history. It’s ties to the Irish Aibhilin (pr. AYV-leen), meaning “wished for,” or “longed for child,” are what sold me on this name for my daughter. I don’t care so much for the avian connections. I’m personally choosing the Anglicized spelling, Eveline, as I love the inclusion of “Eve” and potential nickname “Evie.” However, I’ll likely pronounce her name as “EV-eh-leen.” AYV-leen is still a contender as I want to maintain its link to Aibhilin and her treasured meaning, but I’ll cross that bridge when I come to it. Thanks for adding this beautiful name to the site! It looks pretty, and I would pronounce it to rhyme with -line. (I also pronounce Ada-line and Emma-line that way.) I do think it would lead to a lot of confusion because of the Evelyn/Adaline/Madeline connection, and that is turn-off for me. Although I like it in theory, I don’t know if it would work in practice. Maybe in a novel, where pronunciation isn’t an issue! Interesting how most are going with the pronunciation av-?-LEEN or ay-v?-LEEN (and variations thereof). The traditional pronunciation in the UK is AV-?-line (line rhyming with wine). Over here it would probably still be mostly associated with the brash, Scouse character of Aveline on Bread! Not sure about Aveline, but Pomeline seems great! I like it better than Apple! It’s like Princess Eugenie…her family calls her YOO-jen-nee (I think), the French pronunciation is uu-zhay-NEE, but American newscasters say it YOOG-en-ee and yoo-JEEN-ey. We gave our daughter, born May 2011, the middle name Aveline (pronounced Ah-vuh-leen). She has a very casual first name, so Aveline comes as an elegant and feminine contrast. It makes a perfect middle name. “Aibhlinn, Aibhilin	(pronunciation: “ave + leen”)	(English: Eveleen, Eveline, Evelyn) A name thought to have Norman roots that means “wished-for” or “longed-for child.” I found the sound of the name appealing, although I wasn’t sure what spelling I’d recommend. From the Norman French form of the Germanic name Avelina, a diminutive of AVILA. This name was introduced to Britain by the Normans. After the Middle Ages it became rare as an English name, though it persisted in America until the 19th century. The correct pronunciation appears to start out like ‘avenue’ with stressed ‘LEEN’ as the third syllable. However, Aveline pronounced as “Ava-LEEN” would have the appealing short form “Ava” and nn “Ayv-ee” (which would probably sometimes be confused with Avery). I just adore this. Boyfriend and I are looking for an approachable Gaelic name that Americans can say. Aibhi is so perfect. Great name! I really like Aveline, more than Adeline. I pronounce it with -leen at the end, and the -line pronunciation doesn’t appeal to me at all (same with Adeline and Emmeline). Not sure if I would ever use it, because of the Evelyn/Adeline/Adalyn/Madeline factor, but it makes a really nice middle name, I think. I just love Aveline! I know that it can be confused for other names, but it’s just so pretty that I can’t help but love it. 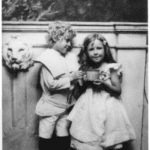 I have an Evelyn and an Alvina in my family tree and I’ve always felt that Aveline is a nice mash up of those two names. I love bird names! Even though she’s not a noble character, I fell in love with the name Adaleen on Big Love. I prefer the Adeline spelling but that’s the only similar name I like. I do think that if I were introduced to a little Aveline, I’d be hard pressed not to think it was a variation of Evelyn. But her history is nice. Oops, the Texas city is spelled “Abilene”…sorry about the typo! Thank you so much for mentioning my blog! I like Aveline, in theory. I say Av-eh-leen, like Josephine, not like Caroline. Is that even right? I like her French roots and her nod to food ( I’m a sucker for food names). But I’d hate to have everyone & their third Uncle mishear her name, repeatedly. It would drive me mad, literally. But she looks so very pretty! One of my favorites! I like the it’s-not-Ava spin and the Ye Olde French roots. Lovely and unique. I considered calling my daughter Adeline. Ay-deh-leen, we would have pronounced it. It was current in the sense that vintage names were back in. Retro chic. But in the end it sounded too much like Ava for us, and much as the name is beautiful there were also too many for our liking. I do like Aveline. But it sounds a bit too familiar again, and I don’t think I’d ever use it. Hmmmm. There is a song by Nickel Creek called “Aveline” and they pronounce it “Ah-vuh-LEEN”, like Kathleen or Maureen. I would probably prefer Aveline to rhyme with Madeline. […] an Irish appellation, Eily is a pet form of Eileen, related to both Helen and Aveline.